Your plants will grow healthier and stronger and therefore you'll get more time to relax and enjoy your garden. Spend less time weeding - Strulch reduces weed growth by up to 95%. Save water - Strulch helps retain moisture around plants, so reducing watering. Improve your soil - Strulch enriches soil with organic matter and improves its structure. Use all around the garden - Strulch is suitable around flowers, shrubs, fruit and vegetables. Save time and money - Strulch lasts up to two years, spreading the cost and giving you more time to relax. Save time and money with Strulch Mulch. Lasting up to two years, you'll spend less time weeding, watering and feeding and more time enjoying your garden. 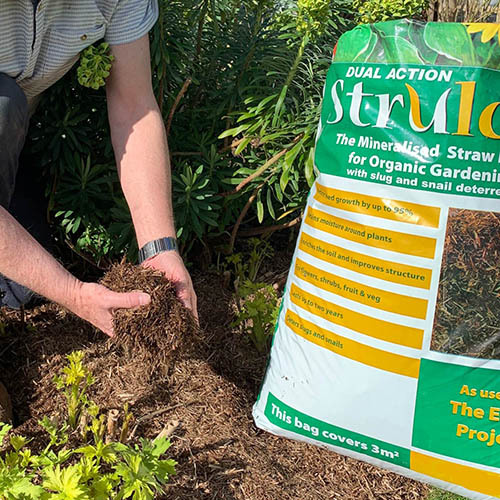 A mineralised straw mulch, Strulch is the new, environmentally friendly and efficient way of applying a mulch to your plants. Used by professionals, Strulch is light and easy to use, and being made from renewably sourced wheat straw it’s a simple way to garden organically. Manufactured in Britain using a new preservation technique, naturally occurring soil minerals are used to stabilise and condition milled straw. This ensures that nutrients are release into the soil not taken from it - so plants remain happy and healthy. Another benefit is that the straw remains attractive for up to 2 years, giving a much more visually appealing finish to your garden, with a rustic, earthy-brown colour which will darken with age. Reducing the need for watering and weeding, Strulch suppresses weeds by up to 95% by blocking out light and prevents moisture loss by evaporation from the soil. It's also great for pest control as slugs and snails dislike the texture so will tend to stay away, while added minerals act as an extra deterrent. With a neutral pH, Strulch is ideal for use around the garden and is organically certified - use it in borders and pots, raised beds and around fruit and veg and in the kitchen garden. Strulch can also be incorporated into compost or soil to improve soil structure. Each 100-litre bag covers approximately 3 square metres. To apply, remove existing weeds and spread the mulch 3-4cm (1.2-1.6in) deep on bare soil around established plants, leaving space around woody stems, and water well. Leave on beds for more than one year or work into the soil to improve soil fertility structure and drainage.